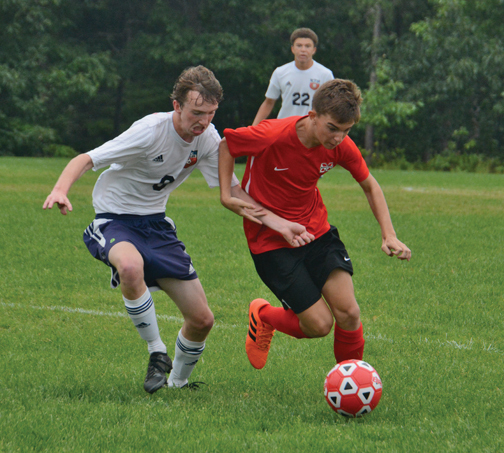 MARQUETTE — An early mistake by Boyne City set the tempo for the Marquette Senior High School varsity boys soccer team in an easy 9-1 victory in its season opener at the Kaufman Sports Complex in Marquette on Monday afternoon. An early own-goal by Boyne City’s Caden Rajkovich put Marquette up 1-0 less than four minutes into the contest and the Redmen offensive attack took things from there. MSHS head coach Dan Menze said the own-goal mishap allowed his team to settle in as he looks to his younger players to move into leadership roles this season. The Redmen made it 2-0 less than three minutes later when junior Trevor Salmon put the ball past Boyne City senior goalkeeper Dayton McPherson. Senior Nicolaas Vermaat had the assist on the tally. Another 8 1/2 minutes later, the Ramblers got on the board when senior William Seaver broke free in the box and put one past Marquette senior goalkeeper Kyle Michelson to cut the lead in half. Menze said the Boyne City goal came at the hands of a defensive breakdown from his own team, but his players quickly regrouped. “We did have a little breakdown and a little learning point for some of the new kids on the team when (Boyne City) scored their goal,” he said. “I think after that we really tightened things up and played really well. The Ramblers’ goal was the last one scored in the first half, leaving Marquette up just 2-1 going into the break. The Redmen picked up the offense quickly in the second half with junior Mack Vezina scoring on an untouched corner kick less than five minutes in to put the lead back up to two. Senior Evan Phillips notched his team’s fourth goal three minutes later after he put home the rebound on a free kick from junior Drew Wyble. Up 4-1, any glimpse of energy the Ramblers may have had came to an end after Wyble found the back of the net himself. Wyble kicked it from distance outside the box and McPherson initially made the save, but it slipped through his hands and in. The Redmen added four more goals, and the game was called with 1:12 remaining due to the eight-goal mercy rule after Salmon scored his third goal. Wyble said he went into the match with a winning mentality but thought it might be a tough contest with the Ramblers not losing any players to graduation last season. Salmon led the MSHS scoring with three goals, while Wyble and Vezina each had two. Sophomore Liam Jeevar played the second half in goal for the Redmen. Boyne City senior Logan Culver received the only yellow card of the match. Full assist stats weren’t available for either team. Menze credited his team for playing well from start to finish and looks forward to watching his players grow as the season gets underway. Marquette travels to Alpena on Saturday for the Alpena High School Tournament that features Alpena, Marquette, Adrian, Lowell, Midland and Troy Athens. Games are scheduled to begin at 10 a.m.
Monday’s JV match ended in a scoreless draw.